"Aging Well, Even After 85"
Workshop in Creative Aging with the film, "Still Kicking"
This program is for: The Get Up & Go transportation and socialization program for no-longer driving older adults at the Peninsula Jewish Community Center in Foster City 94404. 5.21.08 Frances Catlett, who will turn 100 in July, is featured in a superb article in the San Francisco Chronicle’s Datebook section on 5.20.08. Building on a recent retrospective of her paintings at the San Francisco Arts and Culture Complex, attended by more than 100 family and friends, the article lists Frances’s many accomplishments. From painting to poetry, bowling to scrabble, Frances continues to inspire as she did five years ago when filmed for Still Kicking. 2.18.08 Still kicking in New England. Amy Gorman will present Still Kicking at the Brattleboro Women’s Film Festival Tues. March 18 6:30 pm, and again on Sunday March 23 1:00 pm. Wednesday, March 19, 1:00 pm, Brookline Senior Center, 93 Winchester St. Brookline, MA 02446, Info: Charlotte Millman 617-730-2770. Thursday, March 20, 2:00 pm, Boston Public Library, "Never Too Late" program, 700 Boyleston St., Boston, MA. Info: Steve Dunhouse 617-536-5400 x2339. Thursday, March 20, 7:00 pm, NewArt Center, 61 Washington Park, Newtonville, MA 02460 Info: Kate Wisnioski (617) 964-3424. Thursday, March 6, 4-5:30 pm, 2333 Buchanan, Enright Room, Community Health Resource Center, 2100 Webster St., San Francisco, Info: 415-923-4155. Theme: The definition of “old” just isn’t the same as it used to be. Medical advancements, improved nutrition, and the ability to create lives based on our passions and talents have changed how we age, what being older means, and how it looks. Join us for an interactive workshop about these themes and more. Co-sponsored by Kiehl’s. 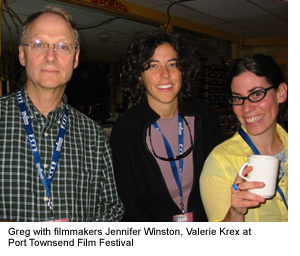 12.13.07 The Brattleboro Women’s Film Festival, Vermont has invited Still Kicking to screen at its 16th festival in March 2008. Amy is trying to work her schedule so she can attend. The Santa Fe Film Festival was lots of fun, even with the temperature dipping into the 20s at night. The opening night reception introduced us to friendly, outgoing Santa Fe residents and volunteers, and other filmmakers. 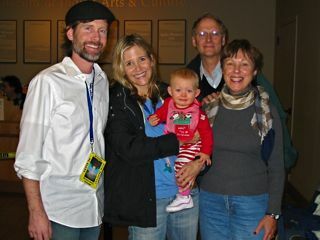 We were paired with the feature, Off the Rocker by director Matthew Bardocz (photo: Matthew, wife Christine, baby Alabama, Roberta and Greg). The second screening provided good Q and A for both films. 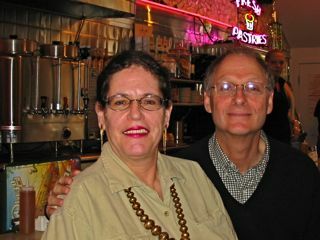 When in Santa Fe, go to the Plaza Cafe and look for waitress Karen Webb. Karen is the subject of the documentary, American Waitress, New Mexico. Besides good food, Karen will keep a smile on your face, and also fill you in on life, moviemaking, and Santa Fe highlights (photo: Karen Webb and me). Amy has been part of several national conferences on aging and has become involved in the Northern Californian Personal Historians Association, writing bios and the stories of our elders. Also, check out Life Planning Network (LPN), a strong force behind planning for retirement through national networks. 11.8.07 Just a few weeks away before heading out to the Santa Fe Film Festival. Still Kicking is paired with a feature Off the Rocker. This double bill will be shown twice, Thurs., Nov. 29, 9:15 am and Sat., Dec. 1, 4 pm, both at the Indian Arts Museum (look for Off the Rocker to find Still Kicking). Over 200 films will be screened at the four day event. 10.23.07 The Oakland Film Festival screened Still Kicking in the large Grand Lake Theater Sunday, Oct. 21. The image and sound quality were first rate on the “big screen.” Amy Gorman and I answered questions afterward with David Roach, festival director moderating. Afterward, we meet Madeline Mason’s daughter Clara Sims and her daughter in the lobby (see photo). We are excited about participating in the Santa Fe Film Festival, Nov. 28 to Dec. 3. Over 200 films will be shown at this eight annual event. Santa Fe represents the 11th festival that Still Kicking has appeared in, a nearly 60% acceptance rate. The films festival run is about over and we will now look into some broadcast possibilities. Amy Gorman will be program moderator and discussion leader while presenting Still Kicking and discussing her book Aging Artfully Dec 7-8 at Eckerd College, Florida at the first-ever Third-age Life Planning Conference. The conference is designed to stimulate cross-fertilization, communication, and collaboration among aging professionals from around the country. 10.12.07 Still Kicking has been accepted into the 6th Annual Oakland International Film Festival. The film screens with other short films on Sunday, October 21 at 5:30 pm, Grand Lake Theater, Oakland. Also, Amy Gorman was recently featured on a KQED radio program discussing the Fine Art of Aging and her book, Aging Artfully. Portions of Lily Hearst playing the piano from Still Kicking were also featured. Check out the archive broadcast. And finally, Amy Gorman, Rosa Maria Morales Escobar, and Faith Petric appeared on ABC's "The View from the Bay" in August. View the program (including scenes from the documentary and hear Faith sing) on the archive. 6.20.07 Aging Artfully was awarded a bronze medal in the Women's Issues category of the 11th Annual Independent Publisher National and Regional Book Awards on June 1, 2007. Entries for this award come from independently published books with 2006 copyrights or that were released in 2006. A total of 2,690 entries came from all 50 US states, 8 Canadian provinces, and 17 additional countries. Amy Gorman, the author was in New York to personally receive the award. She is a member of the San Francisco chapter of the Women's National Book Association. I was unable to attend the screening at the Mendocino Film Festival, but Amy Gorman attended and had this to report, "Still Kicking" received outstanding feedback. The town was a-buzz; the attendees were far more than anticipated. The number of films screened were double those of 2006, the first year of the Festival. The quality was so outstanding that it made choosing which film to see at a given hour, very difficult. The welcoming staff were always a pleasure to work with." 4.26.07 Still Kicking is one of 11 films selected for the 2007 Hearts & Minds Film Festival's Family Fare Showcase presented Saturday, May 5th. Hearts & Minds Film Family Fare Showcase Selections are especially suited for the whole family to watch together. This event will be held at the Schwartz Center for the Arts, Dover, Delaware. Amy Gorman will be speaking at the Summer Series on Aging, June 25-27 presented by the University of Kentucky College of Public Health & Sanders-Brown Center on Aging. Presentation and book signing which follows, is on Wed. June 27. 11:15 at the Marriott Griffin Gate Resort, Lexington, KY.
MAY IS OLDER AMERICANS MONTH, see the new screenings below honoring Mother's Day! 4.17.07 The Mendocino Film Festival has paired Still Kicking with Do Not Go Gently in the Films on Art category. Do Not Go Gently follows three seniors struggling to come to terms with change and the power of imagination in aging, directed by Melissa Godoy. The pair will screen Friday, May 18 at 10:00 am. Albert Maysles is the festival's guest of honor. Along with his brother David, they are credited with being pioneers of "direct cinema," an offshoot of the French cinema verite, and have collaborated on some of the most respected and controversial documentaries made in the U.S., including Gimme Shelter, about the notorious Rolling Stones concert at Altamont, and Grey Gardens, a strangely loving and sometimes disturbing portrait of an elderly mother and her 50 year old daughter. Still Kicking is now available on Amazon and Film Baby, in addition to Midwest Tape and Golden Bear Casting. MAY IS OLDER AMERICANS MONTH Mother's Day Events: MAY 10, 11, 12 Three events celebrating our mothers feature author Amy Gorman's book, Aging Artfully: 12 Profiles of Visual and Performing Women Artists 85-105 (which includes Frances Kandl's CD, "7 Songs of Women's Lives"), and Greg Young's DVD, Still Kicking (32 minutes). 3.15.07 Frances Catlett is the featured artist at the Prescott-Joseph Center artist reception March 16, 920 Peralta, Oakland 94607. The show runs from March 1-May 3. Frances is one of the women also featured in Still Kicking, and in the book Aging Artfully. 3.13.07 Still Kicking has been reviewed in the March/April issue of Video Librarian (on news stands everywhere) and received a three and a half star, highly recommended rating. Amy Gorman attended the joint conference of National Center for Creative Aging and American Society on Aging and reported the conference is 4000 people with 1500 presentations, all about senior centers, policy, Alzheimer's, Lifelong Learning, brain research, arts and creativity, etc. Amy writes, "wonderful new research points to the advantages of arts engagement in later life as being healthy and increasing longevity. New organizational and artistic partnerships are being made nationally with more and more people knowledgeable about the positive effects of artistic activity. Still Kicking was shown during the conference to great response. She also noted the National Center for Creative Aging is moving to Washington DC from New York to partner with Gene Cohen and his research team at George Washington University." 2.27.07 We just returned from the Show Me Missouri Film Festival. The festival was wonderful, enthusiastic volunteers, historic venues (see photo below of the Gilloiz Theater), and strong film selections. The downtown art district is a perfect location for the festival, which should grow into one of the select midwest festivals in a few years. While there, I received notice Still Kicking was accepted to the Mendocino Film Festival, May 17-20. Their web site says Albert Maysles and Danny Glover will be guests. 2.15.07 We had a great screening at the Pacific Grove Rotary's annual Valentine lunch on the 13th. 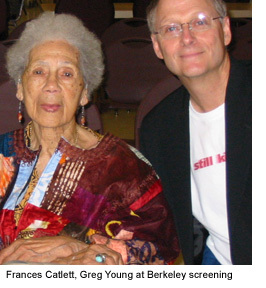 Frances Catlett, 98 is part of the Art of Being Black exhibition that is being shown throughout the Bay Area. Her painting can be seen at the Richmond Art Center. The day before, I met with Calixto Flores, Max Pictures, and Michelle Frey-Schutters of UC Berkeley for a tour of Pixar in beautiful Emeryville, thanks to Daniel Annereau. Exciting! 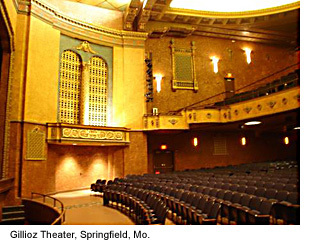 2.7.07 The date for the Show Me Missouri Film Festival is Feb. 24, 5 pm at the historic 1100 seat Gillioz Theater, Springfield, Mo. The Santa Barbara Festival was great fun. Amy Gorman and I got to walk the red carpet before the Will Smith event. OK, so did about 1500 other folks, but with fans four deep lining both sides with their cameras ready for Will, Tom Cruse, and Katy Holmes, we got a rush anyway. The screenings of Still Kicking went well, about 70 to 80 folks at each, not bad considering the downpour during the first screening. It was a good Q&A afterwards. Congratulations to all the volunteers who made the festival a great success for our film. 1.16.07 The dates are set for the two screenings at the Santa Barbara Film Festival. They are Sat. Jan. 27, 1:30 pm at Marjorie Luke Theater and Wed. Jan. 31, 1:00 pm at Center Stage Theater. Amy Gorman and I will both be there for the Q&A after the show on Saturday, I'll be doing that solo on Wednesday, as Amy has local screenings back in the Bay Area (see below). Listen to the internet radio interview of myself and Amy Gorman on Full Power Living hosted by Ilene Dillon. 1.4.07 The following dates have been arranged for additional screenings for the San Francisco Bay Area. Author Amy Gorman will be present at all these events to answer questions and sign her book, Aging Artfully. Both Still Kicking and Aging Artfully will be offered for sale. Call (510) 527-4977 for additional information. All events are free unless noted. Greg Young and Amy Gorman will be appearing on Full Power Living, the only internationally-broadcast radio show dedicated to "awakening the world to the power and importance of human emotions," at 9 am, Thrusday, January 18, 2007. During their appearance, they'll be talking about Still Kicking and the book, Aging Artfully, and what they discovered and learned for themselves in relationship to their interviews of the 12 elderly artists. 12.30.06 Still Kicking will be shown at the 22nd Santa Barbara International Film Festival January 25 to February 4. It will be shown with Glimpses of Heaven, a film which explores three distinguished Canadian artists: George Littlehcilld, Peter Gary, and Wayne Ngan. Will Smith, Al Gore, Forest Whitaker, and Helen Mirren will be receiving special awards at the festival so it should be an exciting week. 12.21.06 The book Aging Artfully by Amy Gorman now has its own web site, agingartfully.com, featuring excerpts, resources, events, reviews, photos, and more. Amy says, "It's very exciting to finally have a site that will offer conversation to viewers about art and aging issues, as well as expand on some of the stories in the book (and documentary). I plan to give updates of the women profiled, and hope to bring readers sloser to them in that way." 12.8.06 Still Kicking will be screened at the Media Festival of the 2007 Joint Conference of the American Society on Aging (ASA) and National Council on the Aging (NCOA), to be held in Chicago, 7-10 March. The film was also accepted to screen at the Show-Me Missouri International Film Festival Feb. 21-25, 2007. The La Pena screening was a great success. Amy Gorman invited several women from the film and book to attend and perform their particular art. The event was a benefit for the Lifelong/Over 60 Clinic. 10.30.06 View photos of recent screenings and festivals. A Pacific Grove writing class by Illia Thompson viewed Still Kicking then were asked to write on their thoughts provoked by the film. We have posted some of the pieces, they are excellent. An article about Amy Gorman's book, Aging Artfully appears in several Bay Area newspapers, read the online version. 9.26.06 The Monterey Herald did a nice feature article on Still Kicking to announce its Monterey Peninsula debut. The text portion of the article can be read online here. 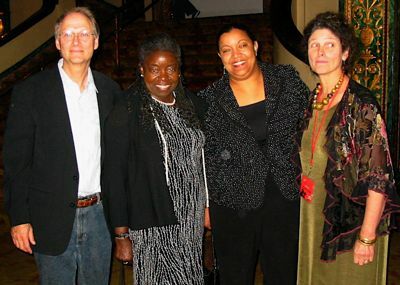 9.24.06 We had a great reception of the screening of Still Kicking at the Port Townsend Film Festival. The small Rosebud Cinema was nearly full, and the Q & A highlighted how many film enthusiast enjoy the festival. Several viewers expressed how much they enjoyed and were moved by Still Kicking. We think the PTFF is one of the most fun small festivals in the country. The weather was mostly clear, 300 volunteers allowed everyone to be treated royally, and the director's reception and awards breakfast were lots of fun. Leaving Port Townsend in rain, we headed for Berkeley and one of several screenings there organized by Amy Gorman and Frances Kandl. The audience of 90 plus included several of the women from the film and featured in Amy's book, Aging Artfully. It was great seeing these women after several years, especially Madeline Mason, now 104 and "still kicking." 9.4.06 We're going to show the film and have book presentation Wed. Dec. 6 at La Pena in Berkeley, 7:30pm. This is a benefit for Lifelong Medical Care. 7.27.06 We are happy to announce that Still Kicking has been chosen as an official selection of the 7th annual Port Townsend Film Festival, September 15-17. It will be screened Saturday at the Rosebud Cinema with a film called Emma, about at 14-year-old bright, but troubled girl who begins to see her way into adulthood. It has also been selected for the 2006 Independents' Film Festival (IFF) showcase! Over 300 films were entered this year and 174 were accepted. The showcase will be televised on The Education Channel, Bright House Channel 18 and Verizon Channel 32, in Hillsborough County, Florida, during the month of September. It's a stellar compilation of films, animations and documentaries! 7.17.06 Two screenings on the Monterey Peninsula have been scheduled. September 27, 6:30 pm at the Sally Griffin Active Living Center, Pacific Grove, CA. This special event is part of the "Art Knows No Age" series. Local guest artists will also present "Creating in the second half of life." The second screening is Wednesday, October 18 at the Carmel Foundation, Carmel, CA 2:30 pm. Another screening is scheduled for Friday, September 29 at 7:30 at The Berkeley Art Center. The film will be shown and the Crones' Kwartet musicians will be playing three songs honoring the women. With the release of Amy Gorman's Aging Artfully book this summer, we are encouraged to make Still Kicking and the book available for purchase. Sales of Still Kicking will help fund future micro-budget documentaries by Golden Bear Casting. 6.15.06 Still Kicking has been selected for the 7th Annual Real to Reel Film Festival, Kings Mountain, NC, July 19-22. 6.07.06 A "Creative Aging" screening is set for September 17 at the Berkeley-Richmond Jewish Community Center. In addition to recently released "Still Kicking," two other films will be shown. "Let's Face It," a funny and poignant discussion among a group of friends, ages 45 to 60, about aging, and "A Specially Wonderful Affair," a wonderful film by Nathan Friedkin about old people in a nursing home writing songs with musician Judith-Kate Friedman. Both have screened at numerous film festivals the last couple of years. The Rockridge Library and North Berkeley Senior Center screenings may also include other films dealing with "creative aging." More on that later. 5.08.06 Amy Gorman recently went to Santa Rosa to visit Ann Davlin and watch Still Kicking together in one of the living rooms, along with other residents and staff. The staff got all excited about it, and so did Ann, who couldn't thank Project Arts & Longevity enough. She's doing fine. 3.27.06 Amy Gorman, director, Project Arts and Longevity, and Greg Young, film maker, visited several of the women to show them the film in late March. They visited Frances Catlett, now 97, Elsie Ogata, 93, and Grace Gildersleeve, 94 to show them the completed film. Elsie didn't have a chance to view it while they were there, she had two flower arrangements to do before closing, she certainly is "still kicking." Frances and Grace both enjoyed seeing the completed film. Frances laughed at the "very old" phrase, until she saw Lily's age, "OK, that's very old," she laughed. Frances said the film gave a positive view. Grace had tea and cookies ready for their arrival along with hugs and kisses. She was silent during the viewing, but afterward said she was honored and a little embarrassed by so much attention given to her. The two minute trailer can be viewed here. Elsie Ogata, now 93, Ikebana artist. She still tries to get to the flower shop two times a week where she helps out with arrangements and expert advice. She wants to go to San Jose to see the Master ikebana artist this spring, evidence she is still growing and learning in her art. Frances Catlett, 97, painter. Frances has had several recent shows of her paintings, one in Oakland, Ca of about 20 paintings and another in Richmond, Ca with 15 paintings. She is looking for an organization who will take on many of her pieces as a permanent collection. In the last year or so, she has completed another four paintings. She still bowls and plays Scrabble weekly. Grace Gildersleeve, 94, rug weaver. Grace still works on her rugs daily, now about 54 rugs since she began in her late 70s. All her friends and relatives have one so she questions if she needs to continue. Ann Davlin, 95, dancer/teacher. Ann has moved to an independent living facility in Santa Rosa. We are looking forward to talking to her. 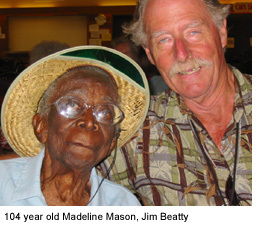 Madeline Mason, 103, doll maker. Madeline is holding her own, according to daughter Clara. Since filming ended, they have been on an Alaskan cruise and cross country train trip back east. Granddaughter Nkenge, who appears in the film, is getting married this spring. Lily Hearst, 1897-2005, pianist. During filming, Lily mentioned one of her goals was to reach 107 and didn't seem too interested in anything beyond that. Lily made her goal before passing away in 2005. Golden Bear Casting has a new web site that includes trailers of our first documentary, Do you know this is a storytelling museum? and several internet shorts.